Luxury gifts and hampers that combine traditional craftsmanship, contemporary innovation and classic style. Todhunter was founded in 2007, born out of their family name and a long-established traditional hamper brand. A quintessentially British brand based in beautiful Sussex, they draw inspiration for their hampers from the surrounding picturesque countryside. 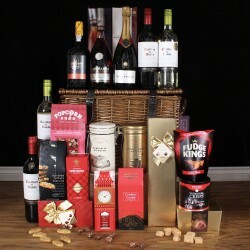 They carefully source a fantastic array of artisan products from established luxury food suppliers as well as from smaller companies who offer new innovations, to create exceptional gifts. All their hampers and baskets are handmade by skilled craftsmen, using techniques that have been handed down from generation to generation. Todhunter regularly meet with their craftsmen and their families, who take enormous pride in their skilled workmanship, and whose expertise ensures the highest standards and the most reliable supply chain.